Easy to install and configure AXIS T8516 PoE+ Network Switch, just as Axis product portfolio, is easy to install by using standard Axis tools as AXIS IP utility and AXIS Camera Management. AXIS T8516 also comes with an individual password and easy to use setup wizard. AXIS T8516 comes with a comprehensive set of configuration tools such as an integrated DHCP server for automatic assignment of IP addresses. It also allows for even more advanced network configuration such as VLAN, QoS, Security, and Spanning tree to further optimize the total solution. 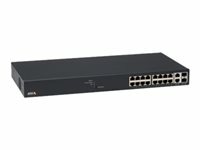 Perfect match for Axis surveillance solutions AXIS T8516 PoE+ Network Switch is made for the surveillance industry and a perfect complement to Axis recorders such as AXIS Camera Station S10 Series. This to simplify further setup and installation of the surveillance systems. Total overview with unique web graphic user interface The unique web graphic user interface offers a graphic topology for easy overview of all devices in the system. The graphic user interface provides information, status and notifications about connected devices. It allows for management of all connected devices, reboot of cameras in the system, monitoring of network traffic, cable diagnostics and much more.